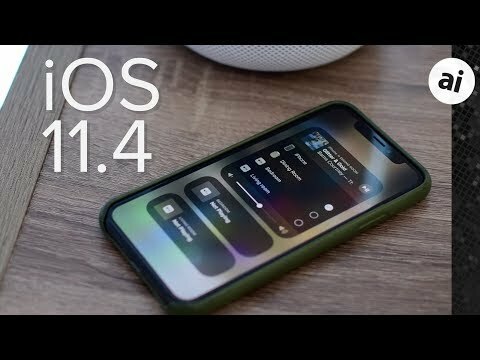 Apple has officially released iOS 11.4 for iPhone, iPad, and iPod Touch which contains many new features, the biggest of which is the long-delayed AirPlay 2. In our hands on video, we demo all the new features that come in the latest major update before WWDC. AirPlay 2, which was originally promised with iOS 11, had previously appeared during the iOS 11.3 beta phase before being unceremoniously removed prior to release. This time around, AirPlay 2 has finally made it to the public. AirPlay 2 is Apple's first major update to its audio/video streaming protocol. Besides the basics like increased throughput, AirPlay 2 brings multi-room audio to iOS and tvOS devices. Now, you can easily stream the same music from an iPhone to multiple AirPlay 2 devices simultaneously. Initially, AirPlay 2 support is limited to the HomePod, Apple TV 4, and Apple TV 4K. Over time, more third-party manufactures will be adding support to their speakers as well. Many manufacturers have already showed support such as the First Alert with the OneLink Safe & Sound and Libratone with their Zipp speaker (review). After updating, AirPlay 2 speakers now act as HomeKit accessories and appear within the Home app. Siri can be used to control playing content on AirPlay 2 devices as well, including the Apple TV. Unfortunately, AirPlay 2 speakers currently cannot be used in any automations or scenes, which is a huge limiting factor for smart home owners. AirPlay 2 also enables stereo pairing support for the HomePod. This is another feature that was delayed, initially expected to launch alongside the HomePod. Following the HomePod update included with iOS 11.4, it is easy to setup within the Home app, and lets you amplify your listening experience if you have two of Apple's smart speaker. Messages in iCloud, which again showed up during the 11.3 beta phase, is also included in 11.4. Now, messages will be completely synced across all devices tied to an iCloud account. Previously, when a new device was set up, no history would be included (unless restoring from a backup) and deleted messages were only deleted on a single device. Now, any action will apply to all iPhones, iPads, or Macs. It is beneficial for legacy conversations and keeping everything in check. Support for ClassKit: Apple's framework for helping developers make their educational apps work with Apple's school-based software, including the Schoolwork app. Alongside iOS 11.4, Apple also released tvOS 11.4, and watchOS 4.3.1 on Tuesday. Airport express get airplay 2? Can't get Messages on my Mac to sync via iCloud. All of my iOS devices seem to work. Anyone else have this issue? Looks like the Mac update isn't released quite yet. Probably still today though. My old Audyssey East Side Dock speaker still working using Airplay after update to 11.4. I am unsure whether it can mesh with the new HomePod speakers from Apple. It has not. It was only in the first beta, and even then, it didn't work at all. We will have more info later detailing the specifics, but basically, you can 100% still stream to AirPlay speakers, same as before. What happens is there are two types of speakers that show under AirPlay. Original AirPlay speakers (where you can only cast to one at a time), and AirPlay 2 speakers where you can cast to many at once. The designator will be the small circle to the right of the speaker. If it has a circle, you can select multiple. No circle, only one at a time. Unless Audyssey updates the East Side Dock Speaker to AirPlay 2, you will only be able to play to it by itself. You have to read footnote 1 in https://support.apple.com/en-jo/ht207428 for confirmation that once Messages in iCloud is enabled, messages are now stored in general iCloud storage (which still counts towards your free 5GB or paid storage plan), rather than iCloud Backup storage. Where is the USB restricted mode for Lightning found? Also, you mentioned new wallpapers for (PRODUCT)RED and I don’t see these on my 8 Plus. Are these only for owners of the RED iPhone?? Since most people have tons of text messages with photos and some videos, it looks like iMessages in the Cloud is Apple's way to get people to buy more storage since 5GB is nothing and people typically have the Messages setting to retain all messages. I don't back up to the cloud since it is not a full backup in the cloud, but many people do and it maxes out their 5GB free storage and so iMessages won't work in the cloud since it uses the same space. Apple should increase their free tier to 10GB and not force people to pay for storage to use features. Thanks for the response but my issue is that Messages/Preferences/Accounts DOES NOT SHOW an iCloud option to turn on. I have three Apple accounts (all active): .mac (default on all of my devices), .me, and .iCloud. All of those are listed as being able to be reached, but NONE of them provide me with an iCloud option. I did sign out, closed the app, rebooted my iMac (OSX 10.13.4) and still no luck. Sounds like I'll have to phone tech support if others do not have this issue. You buy an iphone and get two years free iCloud storage equivalent to the capacity of your iPhone. this approach ties into Apple’s whole ecosystem paradigm. it would be interesting to see modelling on which would generate an overall higher ASP, the current approach or this idea. Further: max how much storage it is possible to get at the current biggest iPhone capacity, then above that pay on tiers like the current iCloud storage approach. This would avoid the problem of future expansion of iPhone capacity. There will be no expectation of more than “a quarter of a TB” of iCloud storage. Unless Apple decided to at the time of course. Apple could even occasionally increase the storage as a selling point “special” or “sale” , for example in the final months of a particular model as flagship to boost sales. Apple could do the same with macs with the same 256gb max. But to make up for hurty feelings for those with large Mac storage capacity, make it three years free “quarter of a TB” icloud for macs before you pay for that amount of iCloud or buy a new Mac. If I use a separate apple ID for messages than I use for the phone icloud setup, does anybody know if there is a way to setup messages in the cloud? Or are you forced to use the same apple ID you use for general icloud that you use for messages in order to use this feature? Actually, recently, Apple has been putting macOS updates out a day (or so) after other OS's. Typically, (if I'm recalling well), iOS (etc.) Tues. > macOS Thursday. Will messages still remain shown on the iPhone when off-line without cellular, data or wifi service? I may out of country and without any service for days on end but need to reference information in messages. There is risk for using iCloud for my messaging if I have no off-line use. 1) 2010 Mac w/macOS Sierra (I can airplay from iTunes and videos within Safari, Quicktime and such, however, this Mac doesn't do AirPlay for a second monitor or mirroring). Maybe dumb question but I noticed messages in the cloud said synced across all iPhones, iPads and Macs, so does that mean Apple Watch isn’t included? I’m a little OCD so I don’t like having tons of convos in my Messages app and deleting them one by one on the Apple Watch is like death by a thousand paper cuts. In the process of updating all my devices now. Correct, it currently doesn’t work with Apple Watch yet.